At the end of the Becoming 2.0 four day workshop we all shared how we get organized. Let’s face it, most of us are expected to do more and more in the same amount of time. Some of the tips and tools the class shared were: Evernote, Getting Things Done, 43 Folders and Google notebook. 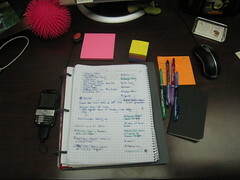 I’ve read about to do lists and index cards on other blogs. I think it’s important to do what works for you and what works for you might not work for others, but I’m always looking for new tips and tools. My system? A notebook at work for note taking and actions items on the right hand side, colored pens to differentiate between different days or subjects, my Centro’s Palm task list, a moleskine for notes from books or other places, large colored post it notes for that days to-do list. Yeah I know, but it works for me ;). What works for you? What tips and tricks can you share? I’ve fooled around with all types of organizational schemes. In the past, I kept a notebook with all sorts of to-do, thoughts, etc. – however, my rebelliousness always made me pick a different page for that day’s notes. While making me semi-efficient, it was also a bit confusing when I attempted to find a blank page and then found a to-do list from who-knows-when! I’ve tried several things since then, including adding the “Remember the Milk” widget to my gmail, a To-Do list on my iGoogle page, and going back to writing things by hand. At this point, I now use a combination of emailing things to myself, post-its for that day’s work, my Google calendar, and my BRAIN! (*Gasp, I know*) It is actually quite efficient for me at this point. We’ll see what transpires in the future… Thanks for this post! As my work LARGELY revolves around my laptop and cell phone, i use these two to the maximum possible.. on my laptop i use Microsoft Outlook the most and hence i use the Calendar and Task options when it comes to scheduling..
For the other work/mail related issues that needs to be done, i use the FLAG option in the mails.. Simply click on the flag icon in the list of mails or right click on a mail and select Follow Up..
here you can set a variety of options as to by when the task must be completed and who must complete it if you are sharing a mailbox etc..
i usually sort my mails by the flag so all the items still to be done is right on the top of the list and as and when it is completed i just right click on the flag and select Clear Flag..
i have written some other simple organisation tips and tips to make your work easier in my blog http://www.manaadiar.wordpress.com..
My biggest organizing tip is to read the mail near a waste basket and toss anything that is irrelevant. My other organizing tip is to always have a clothes basket lined in a large black plastic bag in the basement for clothing and items you no longer use. When I get a pile, I bag them up and put them out on the curb for the various charity trucks that regularly make their rounds. The most effective tool I have ever had to be organized is Microsoft OneNote. it really changed the way I organize all my info. Every thing that I might need to remember in the future. My diary for arrangements, a small notebook to write down all that I have to do and lots and lots of post-it notes. As I work from home, being organized is super important to me. I may have written many articles on how to organize your home with feng shui http://the-divaliscious.com- but when it comes to being organized in my own life – I can at times, laugh that I have found a previous week’s to do list which has several items I was about to add to the new to do list…obviously being organized does not necessarily translate to having those things being done. I recently tried something new – along with creating the things to do list, I made a list of those things I accomplished in the day…I was amazed how easily I was inspired to see how far I could get this ‘accomplished list’ to go…no matter how trivial the task was, I saw where my day went, and more importantly, I saw results. As soon as I finished something – even as mundane as doing the laundry and putting it away, down on the list it went. Lastly, when it comes to projects, I have so many going all at once, I create a page for each project, list the steps to be taken, and as my week and days go by, I cross off, add to, etc. to these lists… keeping tabs of what has been done and what’s still necessary to complete. Sometimes, its great to even list all the projects you have ‘open’ to see which one’s need prioritizing and which one’s should be put on the back burner. This helps to calm your mind I find, to then concentrate what’s important.